One of the best upgrades you can make to your outdoor cooking space is by investing in an outdoor chiminea. These outdoor fireplaces look beautiful on any patio, and a great source of heat for those summer evenings as the sun sets and the temperature starts to drop. Here are my 5 picks to help you elevate your patio to an outdoor vintage lounge area. Deeco CP Western Basket Weave Jr. This ultra lightweight wood burner kicks off our list and for good reason: It’s simply the best one out there. It produces minimal smoke so you can use it day in and day out. 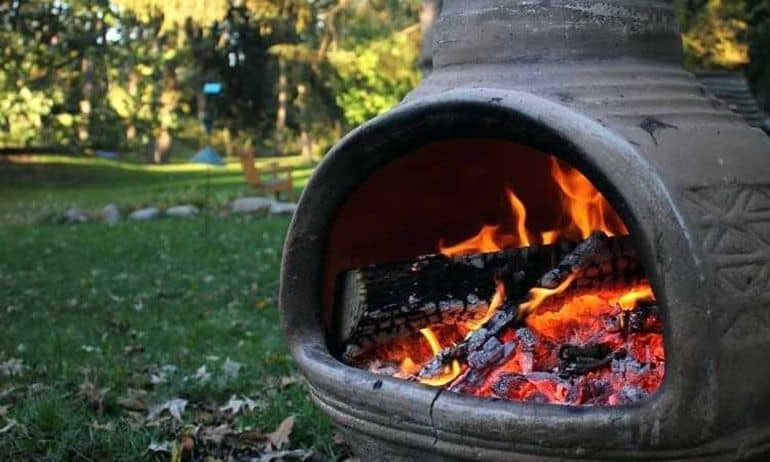 It is one of the very few chimineas that can burn logs of over 18 inches in length. It’s easy to clean, and it’s wide mouth opening allows you to place the wooden logs without any hindrances. The cast aluminum construction means that it can last for a long time. The prairie style adds to the outdoor aesthetics. It has a safety door incorporated into the design which can open easily to add wood. You can also open it, and roast marshmallows whenever required. It comes along with a variety of accessories like rain lid, grilling insert, mouth screen, and wood tool. The grilling insert makes sure that you can quickly cook your favorite food right on the fire. It has two carrying handles on the sides which allow you to move it around. The chimney comes along with the manual and assembly instructions which make it easier for you to use it. So if you’re looking for an aesthetically pleasing and efficient aluminum chiminea, this will not disappoint you. The design of this chiminea incorporates various aspects of flora and fauna in its design. That is why; it complements the surroundings perfectly. The detailing and the designing is intricate which makes it stand out. You can notice the dragonfly-based design. With heavy-duty cast aluminum construction, you don't need to worry about wear and tear. It can accommodate logs of wood above 20 inches due to the wide-mouth design. The easy to clean chiminea requires very little maintenance. The minimal smoke generation makes it suitable for outdoor use. The usual accessories which you might expect from a chiminea come along with it. These include mouth screen, grilling insert, neck spark screen, rain lid, and wood tool. The carrying handles on sides means that you move it wherever you want. The cast aluminum construction reduces the weight which makes it easy to move it around. The hardware, mouth screen, and the bolts consist of stainless steel which further adds to the durability. The spark arrestor neck insert ensures that the fire always burns at a safe intensity. It also induces excellent efficiency. If you prefer an artistic chiminea which is highly efficient, you can go with this option. 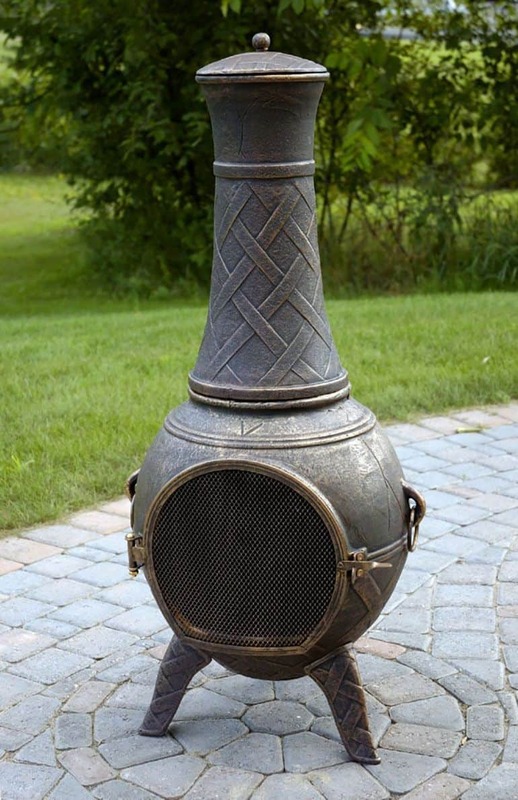 Chimineas have been around for quite some time, which makes vintage designs really popular. If your requirement is the same, the Venetian chiminea which we are highlighting now will suit your needs perfectly. As the name itself suggests, it reflects the Venetian design and art. The large-mouthed design means that you get to observe and supervise the fire from 180. The largemouth ensures that it is easy to ignite the fire. With the rust-resistant cast aluminum construction, you can use it outdoors regularly. You can easily place logs of wood more than 20 inches in size inside the mouth of the chimney. But this model isn't just about aesthetics. The fully functional design along with the stainless steel safety door makes it easy to use. You can easily roast marshmallows or use the grilling insert to grill your favorite delicacies. When you’re in the mood to relax, you can light up the fire and sit around it to get much-needed warmth. The minimal smoke means that you can sit in the vicinity of the chiminea without any issues. The circular bottom design makes it highly stable. It allows you to place it on any surface. The main USP of this chiminea is the artistic design and the largemouth which enables you to grill not only your favorite delicacies but your entire dinner. #4. Deeco CP Western Basket Weave Jr. The first feature which you will notice about the next wood burner on our list is the unique bronze finish. It gives it an antique look. If you’re searching for a chiminea to complete the antique look of your backyard or your patio, this one is the perfect option. 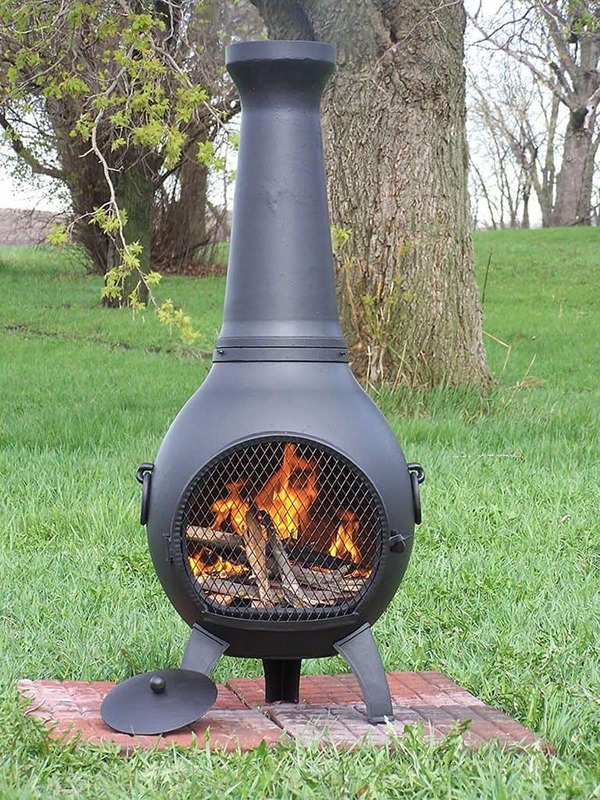 The chiminea itself consists of cast aluminum which provides it with much-needed durability. It includes a removable lid on the top which protects it against debris and rain. The hinged safety screen in the front can be easily opened to grill your favorite delicacies or to place wooden logs. The built-in grill allows you to grill your food without having to buy any extra accessories. The efficient design ensures proper heat distribution which is an added advantage. There is also a log grate on offer which makes it easier for you to place the logs of wood. Since all the wooden logs will be on the log grate, it ensures efficient burning. You will not have to intervene to burn all the wooden logs. The spark guard screen which comes along with it keeps the fire in check. You have to merely sit around the chiminea and enjoy the ambiance rather than worry about displaced logs of wood or the fire burning too quickly. The feet at the bottom ensure that it is entirely stable. So, if you’re looking for the best cast aluminum chiminea with the antique look, you can certainly consider this option. As this list shows, Blue Rooster simply dominate this industry. The Blue Rooster Cast Iron Casita Chiminea which we are discussing now comprises of heavy cast iron. The advantage of cast iron is that it can not only handle high temperature but also wear and tear. It means that you will not have to worry about replacing it anytime soon. When you look at the construction, it resembles a casita and hence the name. The heavy-duty construction not only makes it suitable for personal use but commercial premises like skating rinks, restaurants, and even campgrounds. The wear and tear is minimal, and hence you will not have to worry about maintenance. The best thing about this chiminea is that it allows you to enjoy the warmth of the fire and cook your entire dinner as well. It is easy to light and produces a minimal amount of smoke. 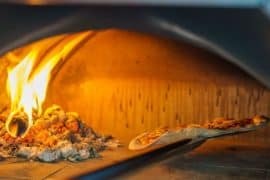 You can bake a pizza of up to 16 inches on the grill. The necessary accessories like mouth screen, grilling insert, wood tool, and rain lid come along with it. The grilling rack is hidden within the design of the chiminea which means that from the front, it will look like an outdoor fireplace. Discreet cooking is possible. When looking for a chiminea for high traffic areas, it does not get any better than this. 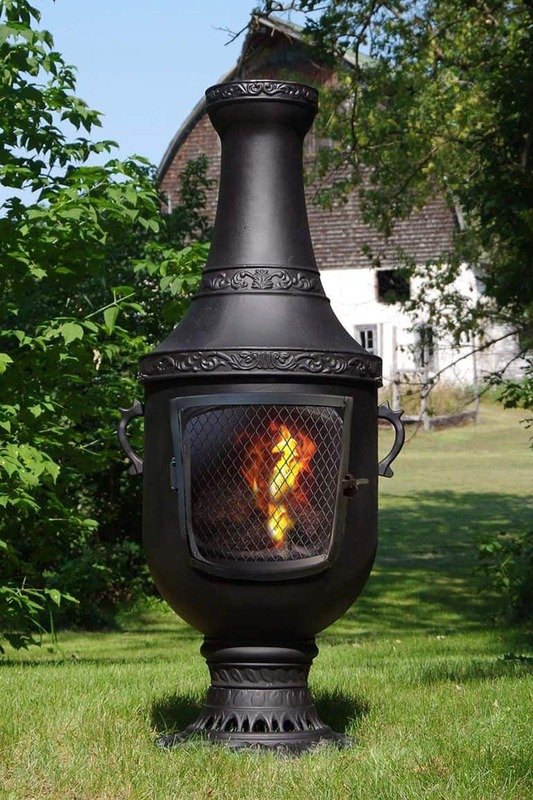 So, if you’re looking for the best cast aluminum chiminea, you can go through our list above. We have curated only the best options available. These chimineas can not only help you create the right ambiance in your patio, backyard but also help you cook some delicacies while enjoying a relaxed time with your family and friends. It can easily take the stress away from your evening and help you prepare food at ease. With these chimineas, you can easily add a new center of attraction to your outdoor area. What are you waiting for? Get one today! A chiminea is an outdoor fireplace that can illuminate an outdoor area and also provide you with much-required heat. 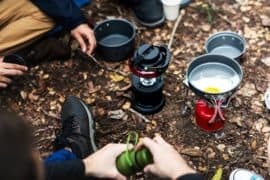 It is immensely useful when you want to spend some time outdoors. The best thing about them is their aesthetic appearance and has that rugged, rustic look which goes pretty well with the outdoor surroundings. Chimineas have been around for quite some time and are popular in Mexico and south-western part of the United States. Globally, the chiminea trend is undoubtedly picking up the steam. The best thing about these kind of burners is their versitility. You can not only use it to get heat but for grilling and cooking steaks as well. That said, it is essential to choose a chiminea made from the right material if you want to get all these benefits. 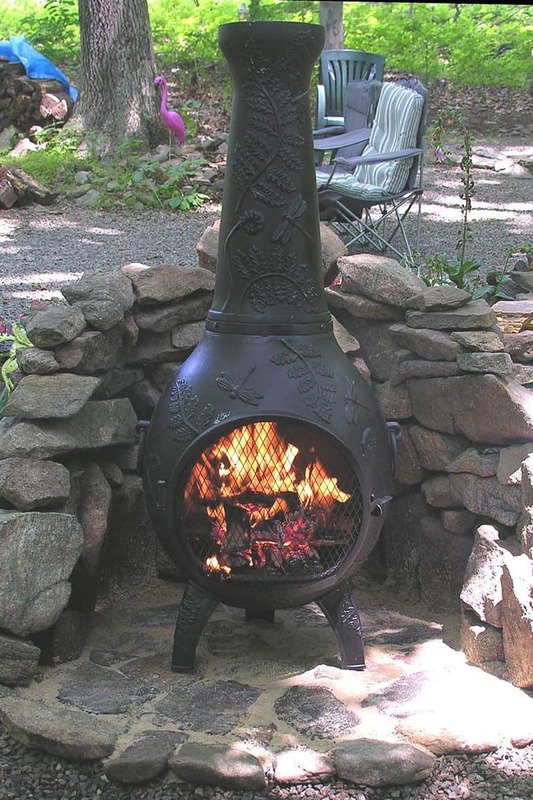 One of the sturdiest options which you have is the cast aluminum chiminea, which provides quite a few advantages over their peers. 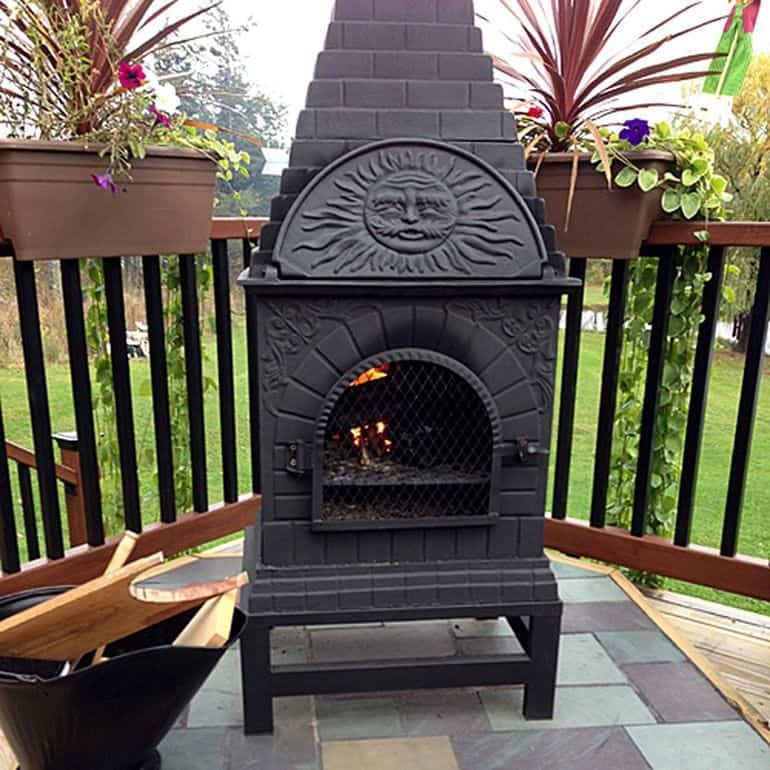 Why should you opt for cast aluminum Chimnea? It is lightweight and therefore more portable. It does not leave stains on outdoor flooring. It can handle high temperatures easily. Most of the cast-aluminum chimineas come along with grates at the bottom. These grates facilitate proper airflow which burns wood efficiently. Thus, when you compare cast aluminum chiminea with those made from different materials, the cast aluminum ones have the upper hand. They offer numerous benefits which make cast aluminum chimineas a superior option.